I was frustrated reading Transcription by Kate Atkinson, because I want everything she writes to be as brilliant as Life After Life. Transcription was good but not great, although, to be fair, I might have been better satisfied with Transcription if I hadn’t known she was capable of so much more. Transcription is the story of Juliet Armstrong, who was an 18 year-old orphan in 1940 when she was recruited by M15 to transcribe the recordings of meetings held between M15’s spies and traitors who believe they are aiding England’s enemies. Juliet is an intelligent young woman who is bored by the vapid conversations she transcribes, but still naïve enough to imagine herself to be in love with her boss, who is happy to take advantage of her feelings. Eventually Juliet becomes a spy too and is directed to infiltrate a social group whose members a British Fascist sympathiser who is believed to have a copy of the ‘Red Book’. After the war ended, Juliet worked for the BBC producing educational radio programs for children, alongside several of her former M15 colleagues. When she receives a threatening letter telling her she will pay for what she did, Juliet believes it may have be from someone she spied on during the war. Juliet was still working occasionally for M15 by providing a safe house for people being surreptitiously shuffled around the world. Juliet is an interesting and likeable character with a sense of humour that read well, although I didn’t connect with her emotionally. The story itself though was slow and at times I had trouble keeping track of all of the characters. There was a twist at the end that I guessed at about half way through the story. As already mentioned, I was hoping for much more. Kate Atkinson remains one of my favourite authors, so perhaps my expectations of Transcription were too high. Behind the Scenes at the Museum was Kate Atkinson’s first book. I’m a fan of her writing, having read and loved Life After Life, A God in Ruins and When Will There Be Good News? My only hesitation initially was wondering if the author might have started slowly with this first book and improved with later books, but not so. Behind the Scenes at the Museum is terrific. Ruby was born in the 1940’s in England into an unhappy family, which makes me wonder if all families are dysfunctional in stories, as otherwise there wouldn’t be a story. Her parents are unable to hide their unhappiness with each other from their children, although they are able to keep some secrets. Some of the secrets, such as Ruby’s father’s girlfriends, are kept secret from Ruby’s mother, while there are secrets, hinted at earlier in the book, which Ruby keeps from herself. Other secrets about other family members, such as the whereabouts of Ruby’s great-grandmother which shouldn’t be known to Ruby, are somehow known to her and she tells these secret stories as footnotes to her own chapters. These rabbit-holes were fascinating and I would love to know some of these sorts of stories about my own ancestors. One of the stories was similar to that of the Teddy’s experience in A God in Ruins. I must check to see if it is the same story, told from the point of view of two different characters. “She pushes her hair back from her forehead in a centuries old genetic gesture of suffering. The life of a women is hard and she’ll be damned if anyone is going to rob her of her sainthood. Sad but true, I recognised my own self in the excerpt above. I hate cleaning the bathroom so I like to make sure that everyone in the household recognises my efforts when I do so. Just call me a martyr and get on with it! Behind the Scenes at the Museum is funny and clever and more than a little on the dark side. I loved it. After reading Life After Life, A God in Ruins and Case Histories by Kate Atkinson, I would probably shell out good money to read this author’s shopping list. Finding When Will There Be Good News by Kate Atkinson made me very happy. Dr Jo Hunter is the central character in When Will There Be Good News. At the age of six, Jo’s mother, sister and baby brother were violently killed in a random act of violence. Jo grew up, became a doctor, married and had a baby of her own, which is when the present day story begins. Jo is kind, loving and charismatic, exactly the type of person everyone wants to be, or to be friends with. Detective Chief Inspector Louise Monroe enters the story when she warns Jo that the killer is about to be released from jail. When Jo and her baby go missing, Jo’s nanny, Reggie, is the only person who seems truly concerned about Jo’s welfare. Jo’s husband tells everyone she has gone to visit her aunt, but Reggie is not convinced by his story. Reggie is a 16 year old orphan. She is brave, smart and resourceful, although she is tested almost to her limits by her brother, who is the worst kind of petty criminal. When a major train derailment in which a number of people die, Reggie saves the life of Jackson Brodie. Also on the train was the man who killed Jo’s mother, sister and brother. I realise I’m describing a cast of what seems like thousands, but they are all in the story for good reason. Jackson Brodie is a former police officer who is now a private detective. Jackson lost his memory in the accident, but when he recovered, Reggie employs Jackson to help her find Jo. If the name Jackson Brodie sounds familiar, it is because he was also the main character in Kate Atkinson’s Case Histories, although When Will There Be Good News stands alone. There are a number of other stories going on at the same time, with a woman and her children hiding from her crazy husband, a married couple who don’t appear to be well matched, an old love affair which the reader hopes will revive, several cases of mistaken identity and more. The characters in When Will There Be Good News are connected and interconnected in a number of complex and sometimes surprising ways. Usually coincidences in stories seem to be an easy way out of a problem for the author but in this story the way the characters connected felt inevitable. All of the character’s stories are satisfyingly pulled together in the end. Jo, Reggie, Louise and Jackson are wonderful characters, all of whom I instantly liked and felt sympathy for. Although the title of the book says it all, the characters are funny and endearing, while the story is uplifting and left me feeling hopeful that this set of characters would eventually experience good news of their own. A God in Ruins by Kate Atkinson might just be the best book I’ve read this year. I read Life After Life by this author last year and felt the same way about that book then. So far, Kate Atkinson is shaping up to be my author of the decade. A God in Ruins uses the same characters as Life After Life, although it is not a sequel. Both books can stand alone, but read together they make an amazing whole. Life After Life is the story of Ursula Todd, who lives her life over and over and over through the first half of the twentieth century, with variations in how things turn out each time. Ursula’s brother Teddy, who was a fighter pilot during World War Two, appears in Life After Life, but A God in Ruins is his story. Ursula is a dearly loved minor character in A God in Ruins. The chapters in this book flit back and forwards in time, telling the story of Teddy’s war, time spent with his grandchildren, episodes from his childhood, moments from his marriage to his childhood sweetheart Nancy, his precious pre-wedding romances and, unhappily, of his relationship with his and Nancy’s difficult daughter, Viola. The story is told through the eyes of most of the characters at some point or other, but it is always Teddy’s story. Viola, Teddy’s daughter, is a horrible mother to her children, the ridiculously named ‘Sun’ and ‘Moon’, who luckily, are known as Bertie and Sunny. Viola takes no responsibility for her mistakes of which there are many, and blames Teddy for all of the wrongs of her world. This turns the reader against Viola, as Teddy is always otherwise portrayed as a good man, a good husband and father and a brave war hero. The chapters which tell of Teddy’s war as a bomber pilot defines his character, showing him to be a strong, brave leader of his crew. The last few chapters which tell of Teddy and his crew being shot down, built up and up to the point where the tension almost became unbearable for me. I felt as if the author gently educated me about the war, particularly humanising the men of the RAF. Superficially, I know the young men who died in the war were people with real lives and loves and fears but, before reading A God in Ruins, to me they were just the 55 or 60 million. In A God in Ruins, these men became real, as Keith and Mac and Charlie and other characters, with pregnant wives and mothers and fathers and mates. Most of the men were superstitious, carrying lucky charms, or protecting themselves with mascots or rituals, whatever crazy thing they could use to ensure their lives continued. The men loved their planes and their fellow crew members. The details of the RAF’s flights in this book are incredible. Beautiful words describe bombing enemy cities, and of then further destroying the cities with fire. Bombing people, women and children. The horror is terrible, but these parts of the book also have a slightly detached feel, almost as if the story was being told with a stiff upper lip. The words and timing of this novel are perfect. There are a great many layers to this story, with secrets to be discovered. After finishing A God in Ruins, I couldn’t read anything else for quite a while, as I wasn’t ready to let go of the story. I wanted to think more about the characters, the possibilities of their lives, the reasons for their characters and morals and also about the title. “A God in Ruins’ comes from Ralph Waldo Emerson, who tells us that men are gods in ruins. Godliness is hidden somewhere in men where they will never think to look, although they will spend their lives searching. As a character, Teddy is one of my favourites of all time. He strives to be kind and to live a good life, and if we all did that, the world would be a better place. My last point may seem trivial, but in this story, Teddy eats a dessert called ‘Far Breton’ while in France. On several occasions, he reminisces about Far Bretons, comparing this custard dessert favourably to a British ‘Plum Duff.’ Obviously I went straight to Google to see what a Far Breton might be, then wrote down the recipe. I wish I’d made a Far Breton to eat while I was reading the book, just to add another level of enjoyment to the story. 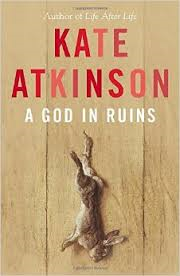 From the way A God in Ruins finishes, and due to the precedent set by Life After Life, I have hope that Kate Atkinson might take another character from the Todd family or community and write their story too. After reading Life After Life by Kate Atkinson last year, I couldn’t resist reading Case Histories. I don’t think Case Histories is as good as Life After Life, but since Life After Life is an exceptionally good book, that doesn’t mean much. Case Histories is still a very good book. The actual case histories in this novel don’t seem to have a common thread in the beginning, although they all tell a story of something going terribly wrong in somebody’s life. There is the disappearance of a dearly loved child, followed by a young mother hitting her husband over the head with an axe after he woke up their baby, (this may seem extreme when you haven’t had a baby in the house, but those who have would understand this young mother’s frustration, and think it a miracle that this kind of murder doesn’t happen more often). The last of the main case histories in this story is the brutal and seemingly random murder of a bright young woman at her father’s workplace. Understandably, the lives of each of the remaining family members in these cases is changed forever. Two sisters of the child who disappeared are desperate to learn what happened to their beloved little sister, although that doesn’t stop these women in their forties from constantly bickering and trying to score points from each other. The now grown up sister of the young mother imprisoned for the murder of her husband is searching for her niece. The father of the murdered girl wants to know who killed his daughter and why they did it. Jackson Brodie, a Private Investigator who used to be a Police Inspector becomes involved in each of these cold cases in a professional capacity. He is the only common thread in the stories which become loosely entwined as you get further into the story. Jackson is a great main character who suffered a sad loss in his own family. Jackson’s daughter Marlee is probably the only really joyful character in the whole book, and her funny little personality balanced out some of the sorrows and shocks in this story. The characters are funny, and likeable, and annoying, and sympathetic and shocking. I was genuinely surprised in the way some of the mysteries in the case histories were resolved, or in some cases, not resolved. Everything I thought I knew or discovered during the reading of this novel was handed to me by the author when she was good and ready, and not before. Some of the answers to the mysteries were very complicated and others weren’t satisfying, but my enjoyment of the characters in this book made up for this. I believe Kate Atkinson has another novel featuring Jackson Brodie and I’m looking forward to reading it too. I didn’t want Life After Life by Kate Atkinson to ever end. Which is funny, because the heroine of this novel, Ursula Todd, who is a heroine in the true sense of the world, lives her life over and over again. Ursula was born in 1910 to an English couple. Again and again and again. Then she dies. Again and again and again. Sometimes Ursula dies as a baby and is born again. Sometimes she dies as a child, and eventually she dies as an adult. As the book continues, Ursula lives longer, and has different experiences in each of her lives, although some events occur and re-occur regardless of the feeling of deja vu which guides Ursula through her many lives. Ursula never quite remembers her previous lives, although she usually learns from her mistakes. Her mistakes include being taken advantage of by a friend of her brother, causing her to fall pregnant without even knowing how it happened, and marrying a bullying, cowardly wife-beater. Eventually Ursula learns how to manipulate her family and friends to achieve her ends too, for continued health and longevity for all of them. The times Ursula live in are central to the story. Her father leaves the family to fight in the Great War, which are her formative years. During some of her lives Ursula lives in Germany between the wars and in one life, she lives in Germany during WW2. In other lives, Ursula works as an English warden during WW2 and in another, she works for the Home Office, surrounded by the people who are making the military decisions which affect the whole world. Ursula’s lives all lead her eventually to a single point, with the reader being led by the author through version upon version of Ursula’s life, waiting and watching and becoming more anxious for Ursula to take a particular action which appears to be her destiny. The essence of Ursula’s family and friends remain much the same throughout each life she live, although her mother, Sylvie, who in some lives is a loving, tolerant mother to Ursula is in others unforgiving and cruel, which seems particularly harsh as the circumstances which govern her mother’s behaviour to her were not caused by Ursula. Sylvie is the next most interesting character after Ursula, and her attitudes and the funny things she says are generally wise and witty, in the very clever, English style of the time, reminiscent of the writings of Noel Coward and the Mitford women. The idea of eternity always really bothers me, because, as I may have commented before, forever is a really long, long time. The thought of living my own life over and over again is intriguing though. The possibility of righting wrongs and doing things better the second or third time around is very appealing, although there are mistakes I would happily make again. Only the future would tell if I got the opportunity to make a grand gesture to change the whole world for the better, in the way Ursula did. It is far more likely that for real people that the small things count, for example the times I bite my tongue when I am tired and cross instead of snapping at my family, or do something for someone else when I would rather not. I could not put this book down. I read it on the train to work, it tempted me all day by sitting in my handbag while I worked away at my desk living through my own version of Groundhog Day, and then I read it on the train going home. Once everyone was packed into bed a little earlier than normal, I hopped into bed and read some more. I could not wait to read the end, to find out what happened, but as I said earlier, I did not want Life After Life to actually end. I’ve already found another Kate Atkinson book to read, Started Early, Took My Dog.